Sometimes I think I may rename this blog to “Confessions of a Florida Herbalist.” Not really, it's just that I seem to open up and confess a lot of myself here. This post I'm confessing that I am a metalhead. Yes. I listen to metal music. The more aggressive, the better. I don't always look like it, and my personality doesn’t always come off as being very metal. But I am. A lot of people, upon finding this little fact out, ask me how I can listen to music that is so full of anger and aggression and retain my “chill” and composure. It's simple really. Metal music helps channel out my negative emotions so that I can better interact with the world-at-large without wanting to strangle people. And that's what I want to share with you today. 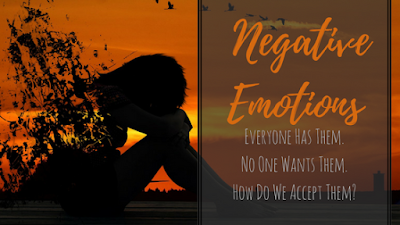 How to accept negative emotions and not fear them or let them end up running your life. American culture seems to be all about getting rid of negativity. Almost every January I hear/read about people's New Year's resolutions to get rid of all the negativity in their lives. Everyone is focusing on the positive and not leaving any space for the negative. Unfortunately I believe this is contributing to the problem rather than helping. I recently had an elderly friend who was told by his doctor that he might have a year left, if he's lucky, and there's nothing that modern medicine can do. When this information was passed on to his wife and friends, the response was always some variant of “well doctors don't know everything, you have years left if you stay positive and motivated.” Well, this is not the response he wanted to hear. He understood that there was always a chance to beat the odds. What he needed and wanted was help to get himself and his family ready in case he didn't beat those odds. No one acknowledged the real chance that he might die, any day, but most likely on a day within this year. Everyone just ignored that possibility and pushed on to “stay positive.” It's not just his situation either. Every day I see more and more positive statements and encounter people who ignore the negative. We, as a culture, are forgetting how to cope. Coping mechanisms are vital to life. They help us accept that bad things happen. They help us to work through hard times and grow as an individual. Without coping mechanisms, we don't work through negativity, we just bottle it up and push it down. When we don't deal with our “darker” emotions, we begin a life ruled by avoidance and occasionally those emotions we are avoiding will creep out in unexpected ways. Everyone has different and unique ways to deal and cope with hard times and dark emotions. However, the journey to learning how you best deal with these emotions is fairly similar for everyone. A lot of people are afraid of these negative emotions. Afraid of the pain. Afraid of the stigma. Understand that having these emotions is normal. You can be sad without being clinically depressed. You can have mood swings without being bipolar. You can feel anxious without having anxiety. These emotions are an important part of life and everyone experiences them. They are not bad. They, in and of themselves, do not indicate a problem. Stop judging yourself for having them. Once you are aware that these feelings are normal, stop and identify them before you react. When you experience the pain, fear, anxiety, anger, etc, take a moment and think about it. Understand what you are feeling and why you are feeling that way. Take a moment to acknowledge that you are feeling sad and why you are sad before pushing it aside and forcing yourself to “be happy.” Be in the moment with your emotions. Once you have identified the emotion and identified the cause of the emotion, you now need to accept and release that emotion. Don't hold on to it. Embrace the emotion and then release it. When you embrace your emotions, you are not controlled by them. You understand that you are not your anger, embarrassment, shame, guilt, sadness, anxiety, etc. You feel these emotions, but they do not define you. Emotions come and go. Welcome them, embrace them, and let them go. Don't hold on to them. Be in the moment, don't live in the past. 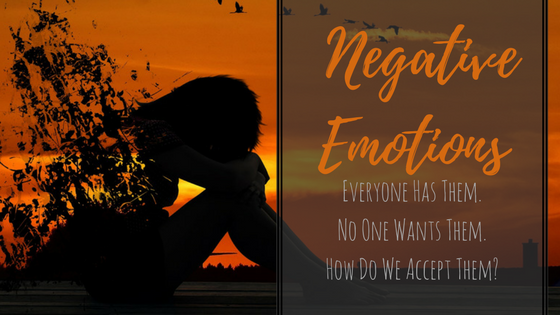 Often when we experience these negative emotions, our brains replay them over and over again. We analyze what we did, and torture ourselves for what we didn't do. Stop. When you do that, you are not releasing the emotion, you are being consumed by it. Stop playing the “what if” game, stop dwelling on things you cannot control, stop thinking about all the ways a certain thing is destined to “go wrong.” Understand that you have experienced an emotion and that emotions are not permanent. Address the emotion and let it go so that it does not take over. Understand that you will feel them again, and welcome when they come, but don't hang on to them. Once you realize that you are not your emotions, you can safely release them. Whether it's by venting into a creative outlet, talking to a good friend about it, meditation, prayer, gardening, physical exertion, or just turning up your favorite song and singing along. Everyone has their own way of releasing these emotions. Some people even have multiple ways. Find what works for you. The negative emotions are only part of your emotional spectrum. Use these same steps for the positive emotions as well. We don't necessarily want to let go of our happiness, pride, and other good feelings. However, when we hang on to them, the negative emotions seem all that much darker. They can also blind you to very real possibilities of things such as failure. Balance in all things, including emotions, is key to staying healthy and in harmony with yourself. I hope I have provided a little help and support for your negative emotions. If you have any questions or comments please leave them below.